Stingrays living in one of the world's most famous and heavily visited ecotourism sites—Stingray City/Sandbar in the Cayman Islands—have profoundly changed their ways, raising questions about the impact of so-called "interactive ecotourism" on marine wildlife, reports a new study published March 18 in the journal PLOS ONE. Researchers from Nova Southeastern University's Guy Harvey Research Institute in Hollywood, Fla., and the University of Rhode Island studied the southern stingray population of Stingray City—a sandbar in the Cayman Islands that draws nearly a million visitors each year to feed, pet and swim with its stingrays—to assess how the intensive ecotourism has affected the animals' behavior. "Measuring that impact is important because there's a lot of interest in creating more of these interactive ecotourism operations, but we know little about the life histories of the animals involved or how they might change," said study co-author Guy Harvey, who initiated the project. The researchers found that Stingray City's stingrays show distinctly different patterns of activity than their wild counterparts, who don't enjoy daily feedings or close human contact. "We saw some very clear and very prominent behavioral changes, and were surprised by how these large animals had essentially become homebodies in a tiny area," said study co-author Mahmood Shivji, director of the Guy Harvey Research Institute and NSU Oceanographic Center professor, who led the study. Wild stingrays are active at night and solitary—they forage through the night over large distances to find food, and rarely cross paths with other stingrays. To see if Stingray City's fed stingrays stray from this behavior, Mark Corcoran, lead author of the study who did the research as part of his graduate work at NSU, and the research team tagged and monitored both wild and fed stingrays over the course of two years and compared their patterns of movement. They found that fed stingrays swapped their normal nighttime foraging for daytime feeding, and in contrast to their wild counterparts, began to rest at night. 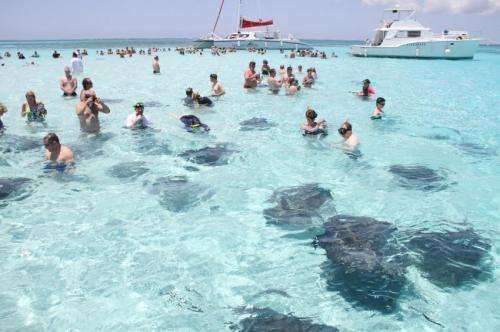 They also didn't mind rubbing shoulders with their neighbors: At least 164 stingrays abandoned the species' normal solitary behavior, crowding together in less than a quarter square mile of space at Stingray City. They even formed schools and fed together. The fed stingrays mated and became pregnant year-round, instead of during a specific mating season, and also showed signs of unusual aggression, biting each other more frequently than their wild counterparts. These results suggest that human-provided food can dramatically change how even large, highly mobile ocean animals behave—with potentially serious consequences, the researchers conclude. "There are likely to be some health costs that come with these behavior changes, and they could be detrimental to the animals' well-being in the long term," Shivji said. Stingray City means big business in the Cayman Islands, where each stingray generates as much as $500,000 annually in tourism income, Harvey said. The team plans to continue to monitor Stingray City's population to track its health—and the industry's impact—over time. "Right now, these animals have no protection at all," Harvey said. "Without more studies like these, we won't know what that means for the wildlife or if we need to take action. It's unclear how much of the stingray's daily diet comes from tourism provided food, but the good news is we have seen the animals forage when tourists are absent suggesting that these animal are not completely dependent on these handouts." If one was to note the human condition, it would compare to the description of how the stringrays, formerly wild, changed their behavior upon dependence for food. You know what? In the end, they're friggin' stingrays. They're not being harmed and they're providing a chance for people to see them up close and personal. Until and unless they adversely affect the humans who seek contact with them, this is research money in search of a cause as far as I'm concerned and proof that there's way too much of it floating around.